To celebrate our wedding anniversary this weekend, we went to Inakaya to try the robatayaki (a Japanese style of cooking food on a grill). Located on the 101st floor of ICC, the tallest building in Hong Kong, this restaurant is one of the few elite restaurants that are part of Sky Dining 101. 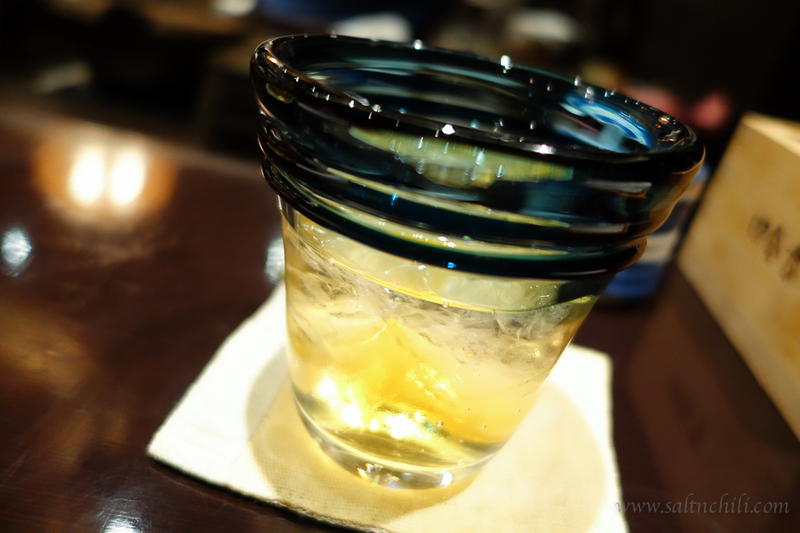 We were at Inakaya last October to celebrate another occasion, but we opted to sit in the main dining area. The ambience of the main area is romantic with dark decor, dim lighting and gorgeous views of the harbour. This area is also split into isolated sections for teppanyaki and a sushi bar. For those who want to try robatayaki, are led to a room at the back of the restaurant. 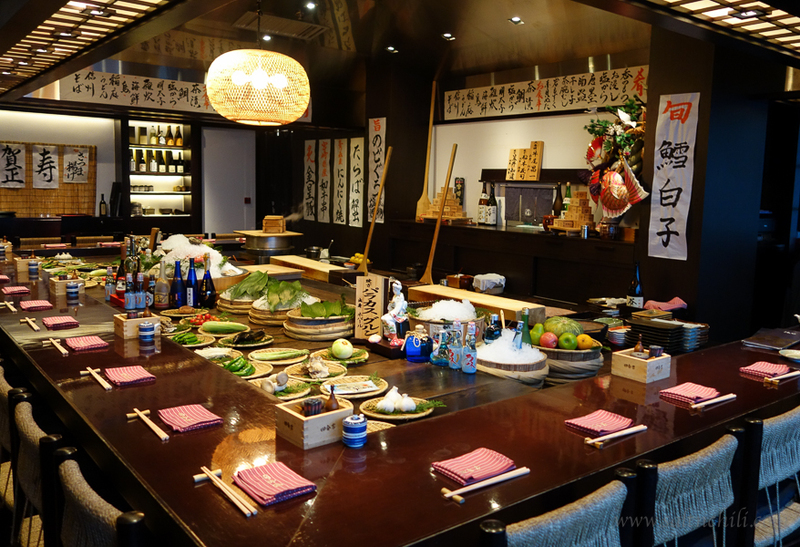 The decor of the robatayaki room is completely different to the rest of the restaurant, in fact it looks so different, one might even think it’s a different restaurant. 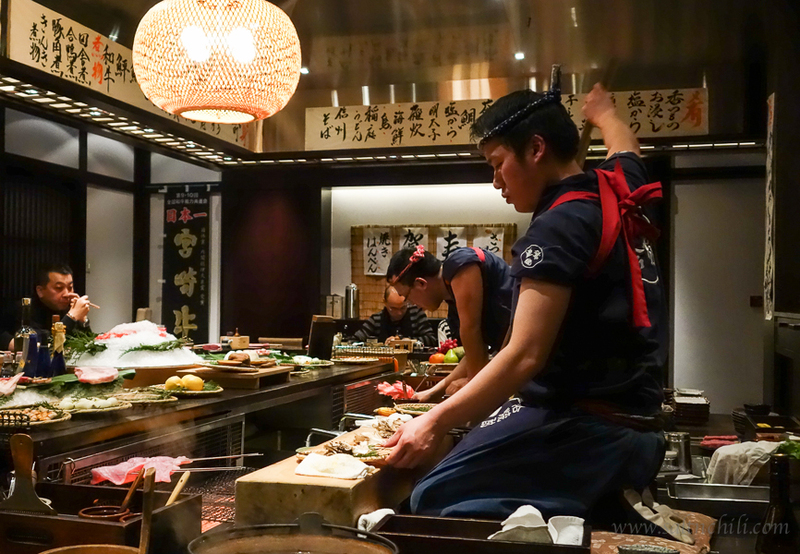 The Japanese-looking room is laid out with the grill in the middle with diners sitting around a U-shaped table facing the 2 knelt chef’s and watch as they prepare and grill the food. 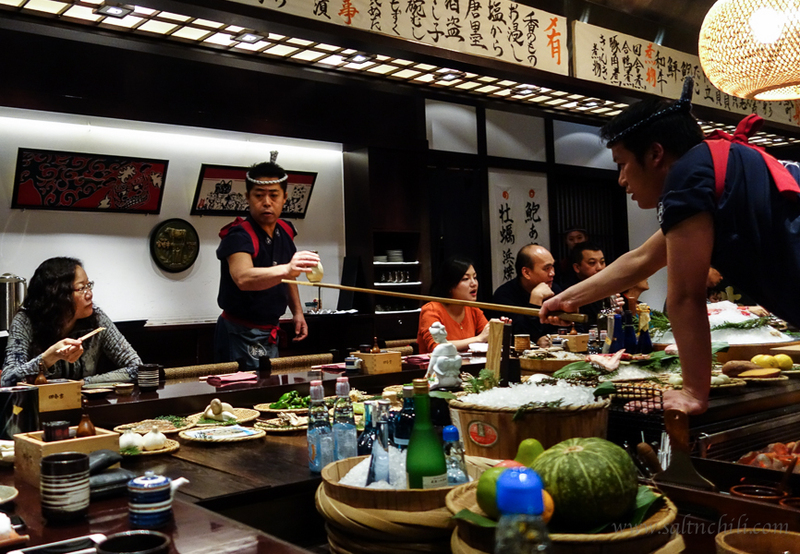 The chef’s would serve the dishes to the diners via a very long wooden paddle (in the above photo, the chef is serving warmed sake). In front of the grill is a selection of seasonal vegetables, seafood and meat, all ready to be grilled. I’ve read that this unique room is a replica of the Roppongi Inakaya in Tokyo. 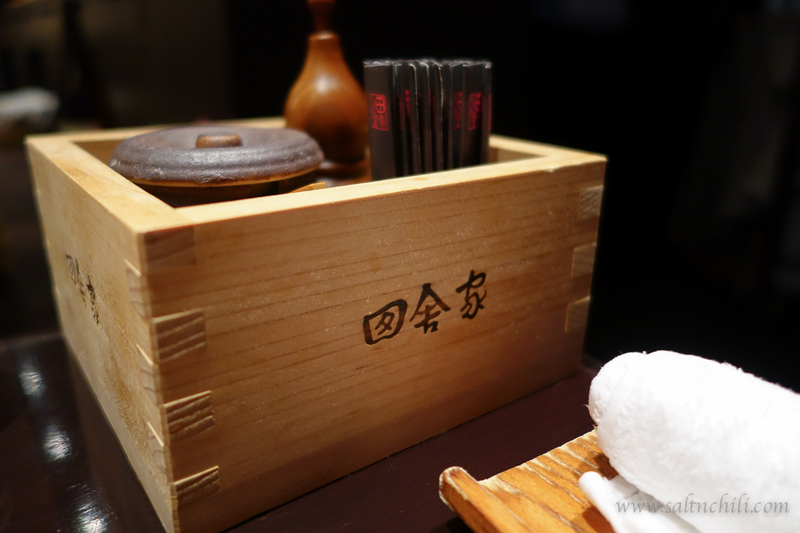 The waitress spoke Japanese, Mandarin and Cantonese (possibly more languages). 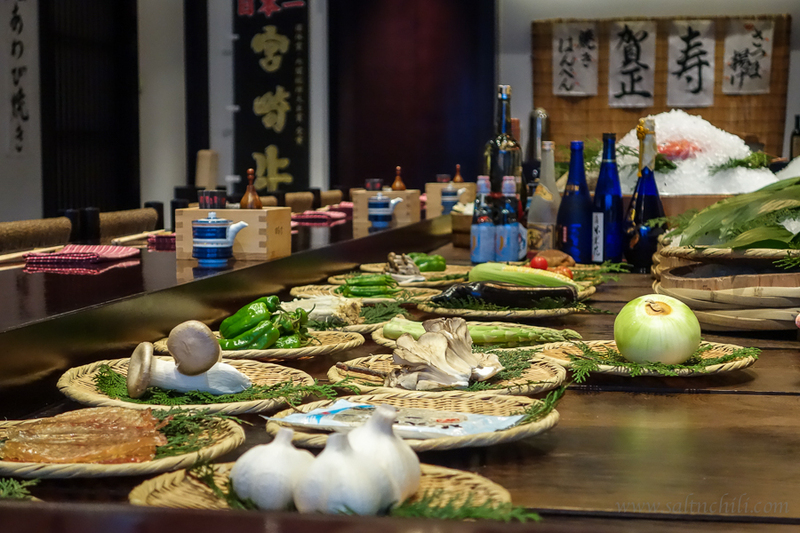 She explained to us that there was no menu for robatayaki, and we could select from the seasonal items laid out on the table (sounds a bit dangerous cost-wise, right? :)). 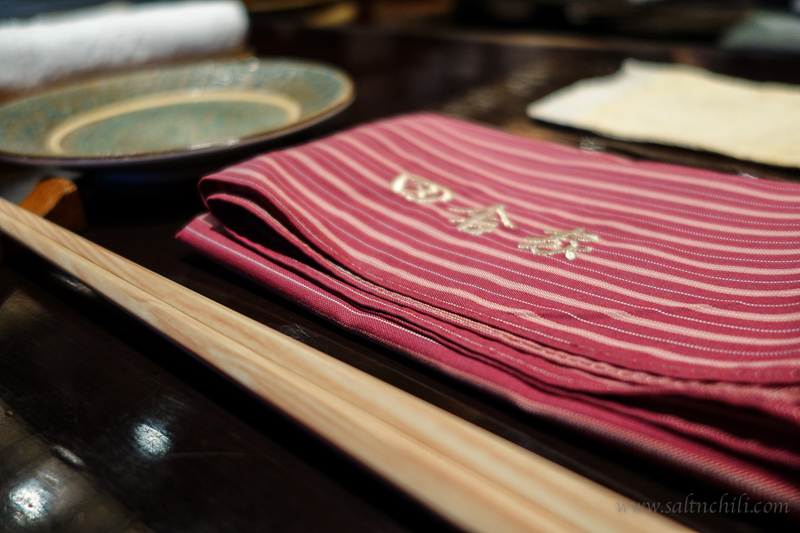 We were also given the choice to order from their main dining area menu (sushi/sashimi, tempura, teppanyaki, etc). The waitress was great with us and took the time to describe all the items and made several good recommendations. After we placed our order with her, a Japanese expediter called out our order in Japanese to the chefs. 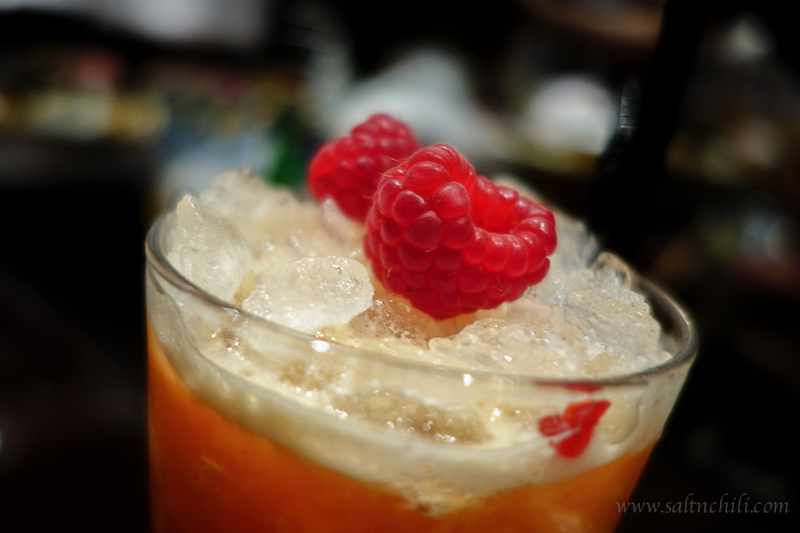 I ordered my favorite Japanese liqueur, a Kiuchi Umeshu (梅酒), and hubby ordered a Cool Passion, a non-alcoholic drink with passionfruit, raspberries, orange juice, lemon juice and pineapple juice. 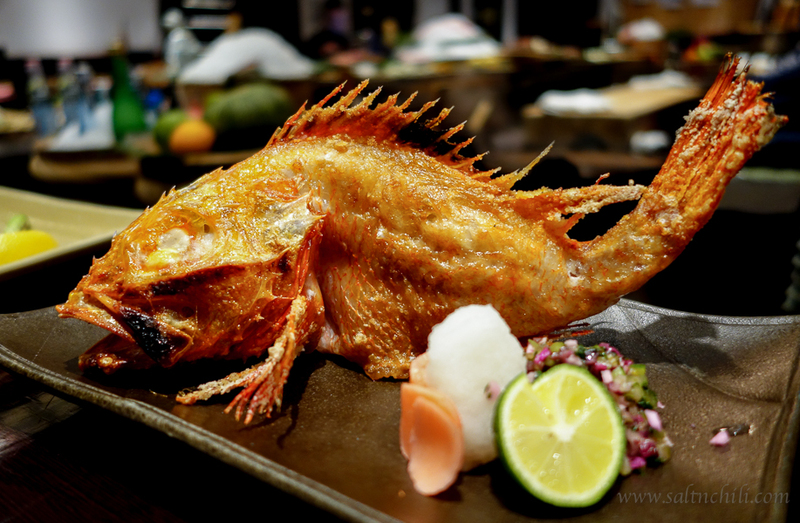 Our dinner started off with the Dried Puffer Fish, which tasted like Dried Shredded Squid (魷魚絲) but less chewy. In fact, this practically melted in my mouth. It was slightly salty with a bit of sweetness lingering in your mouth afterwards. The Chicken Wings were flavourful with crispy charred skin and with a squeeze of lemon juice this everyday food item became a knockout. 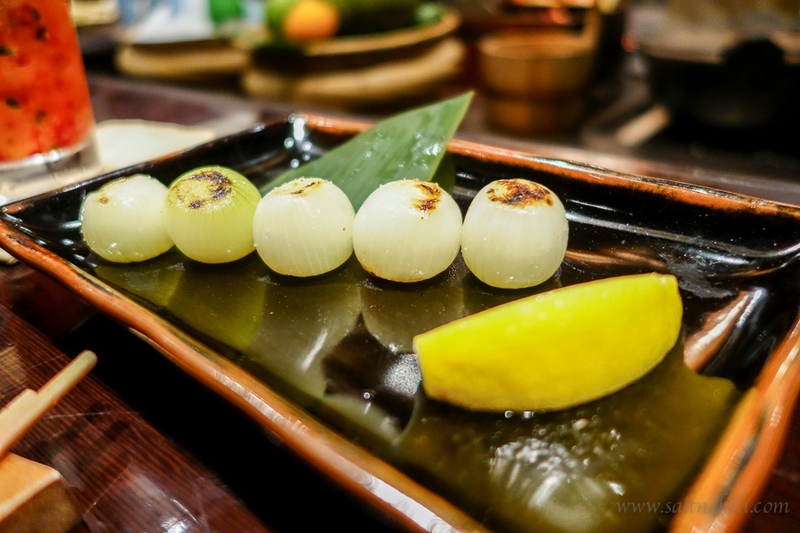 After grilling, these Baby Onions became very sweet and we gobbled these down in no time. And of course, I had to order the green chili peppers laid out in front of us. 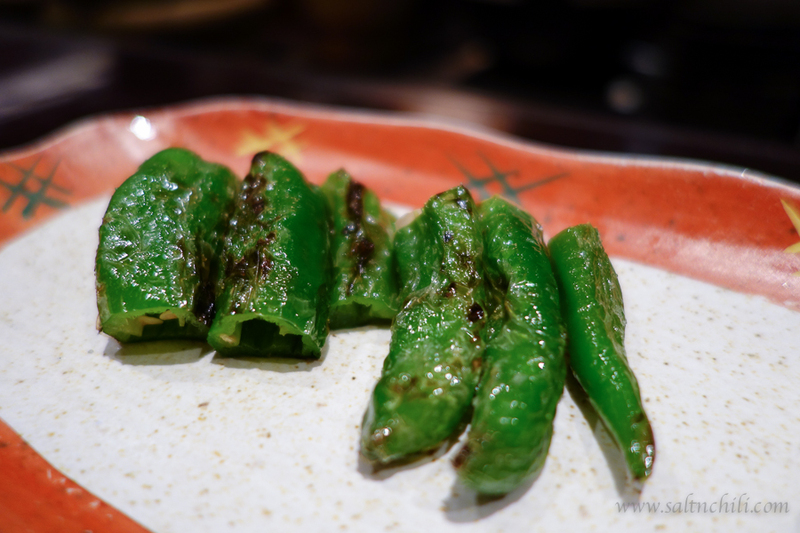 The waitress told us these were Manganji Peppers from Kyoto, and we shouldn’t expect them to be too spicy, as Japanese peppers are generally not too spicy. And she didn’t lie, the peppers weren’t spicy at all, but they were very juicy. 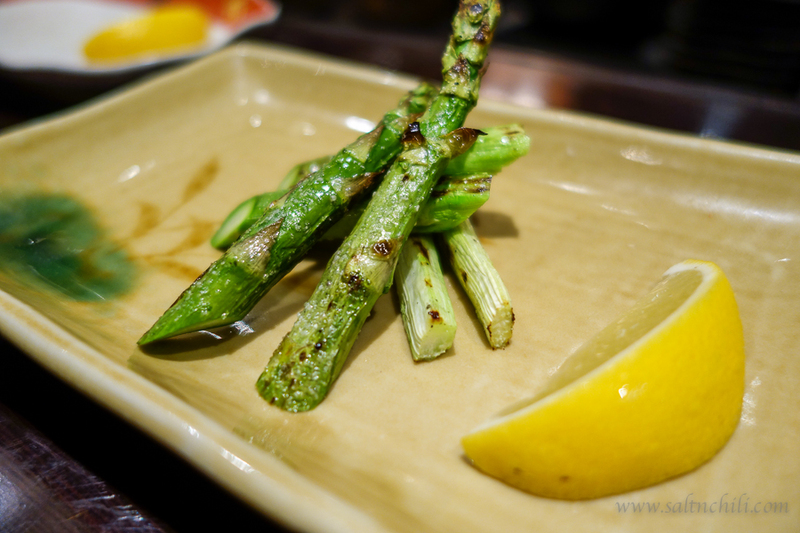 There was no surprise with the asparagus, it was lightly salted and grilled to perfection as expected. 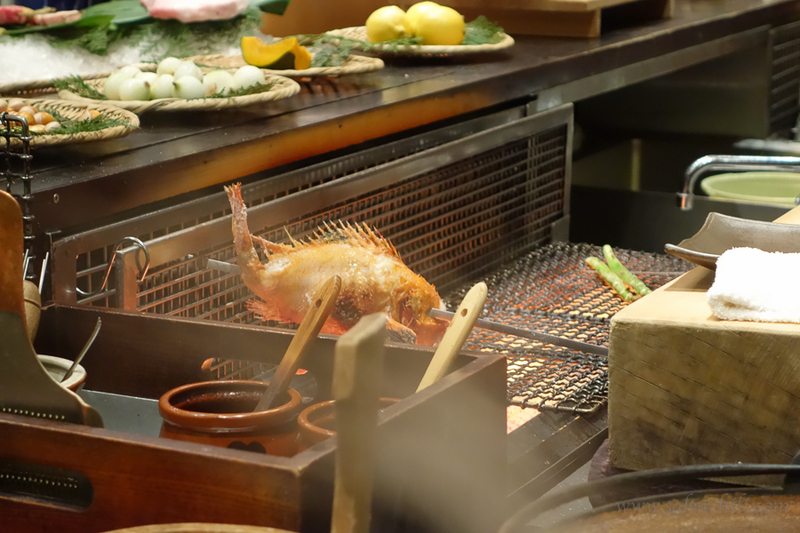 The highlight of the evening for me was the Kinki Fish Robatayaki (Hokkaido Rockfish). This fish is also known as the Idiot Fish, and ironically we were the idiots paying $1430 for this fish. I admit it was a bit of a splurge to order this exclusive fish, but I don’t regret this choice. 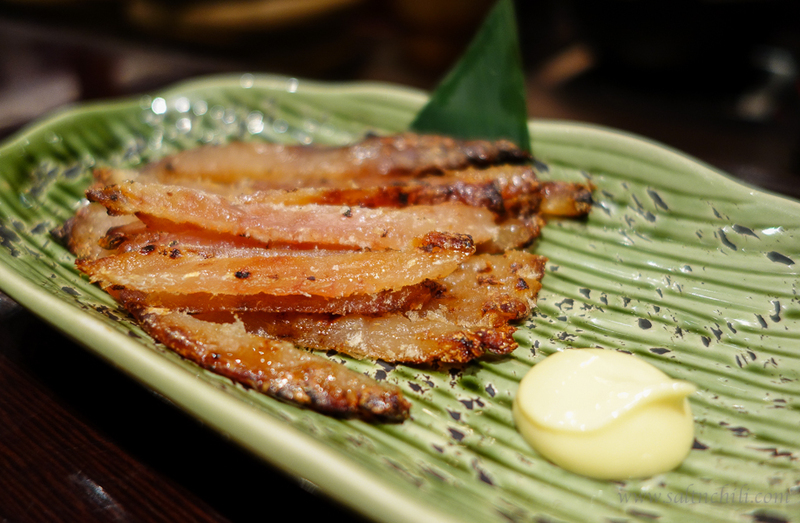 The white fish meat was delicate and creamy and the skin and fins were grilled to to-die-for crispness. Just writing about this is making my mouth water again. 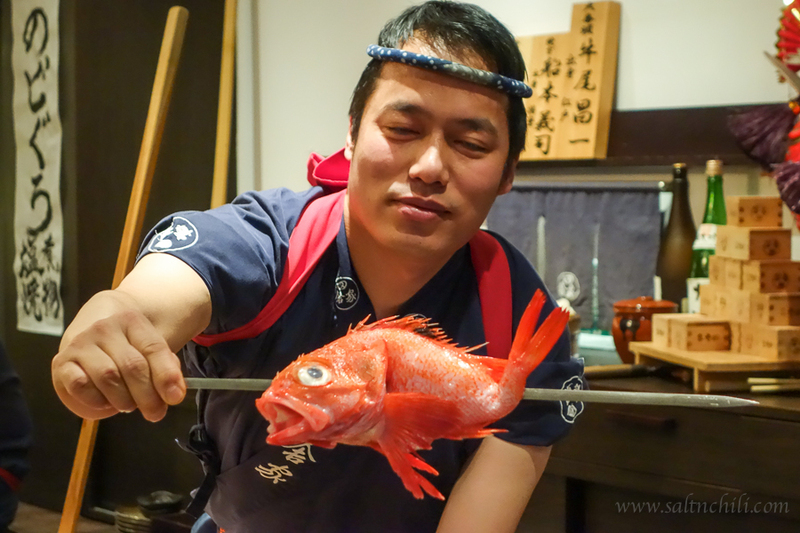 You can have this fish with some soy sauce and daikon, but I preferred having it as is. After we devoured the fish, we cleansed our palette with some homemade pickles. 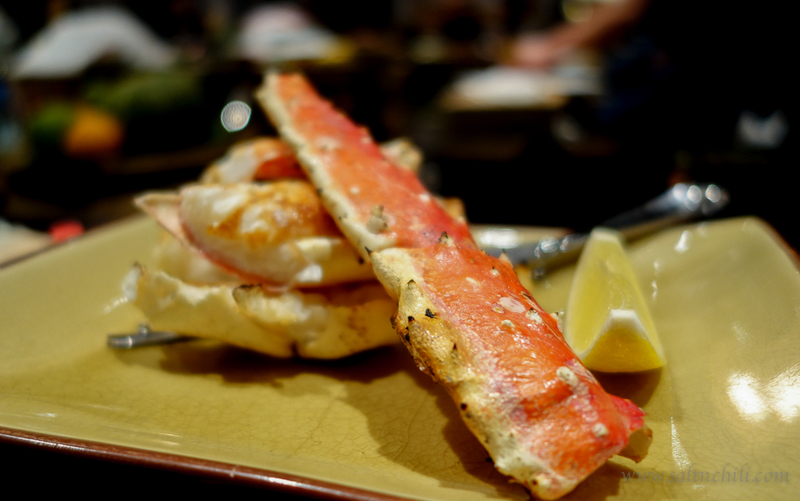 I’ve never really been a big fan of King Crab Legs, but this was a recommended item. It wasn’t one of my favorites, but I liked the fact that it was split open for us already and that we didn’t have to struggle with getting the meat out. 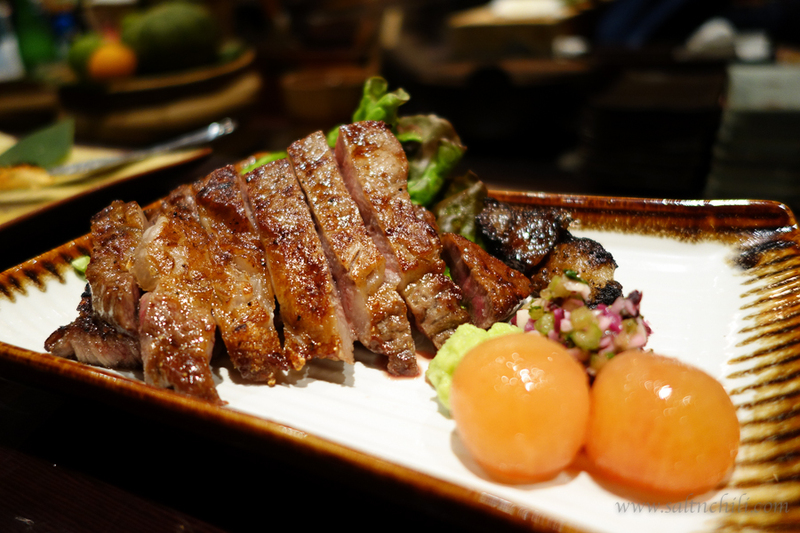 Again we splurged and treated ourselves to a A5 Wagyu beef steak, this was definitely the highlight for my steak-loving hubby. The chef recommended cooking this steak Medium-Well (American steakhouses usually recommend Medium-Rare) so we tried this wellness. To our surprise, the beef was juicy and tender and it melted in our mouths. 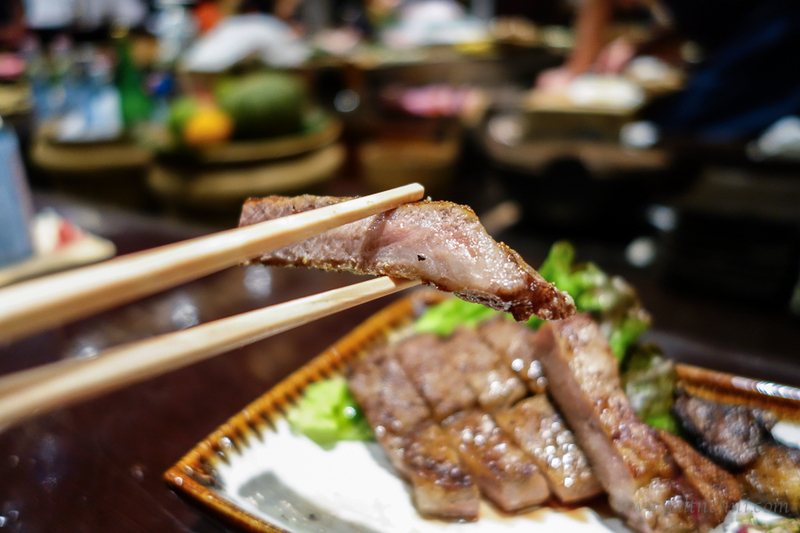 The marbleization of the meat was perfect. We were given 3 condiment choices, a Truffle Salt, Sour Daikon and Wasabi. I thought the truffle salt was very special, just a few grains and you can taste the truffle. Pickles and chilled cherry tomatoes were a refreshing and cleansing treat at the end. At this point I was stuffed and couldn’t possibly eat anymore. Hubby couldn’t resist ordering a rice ball to complete his meal. 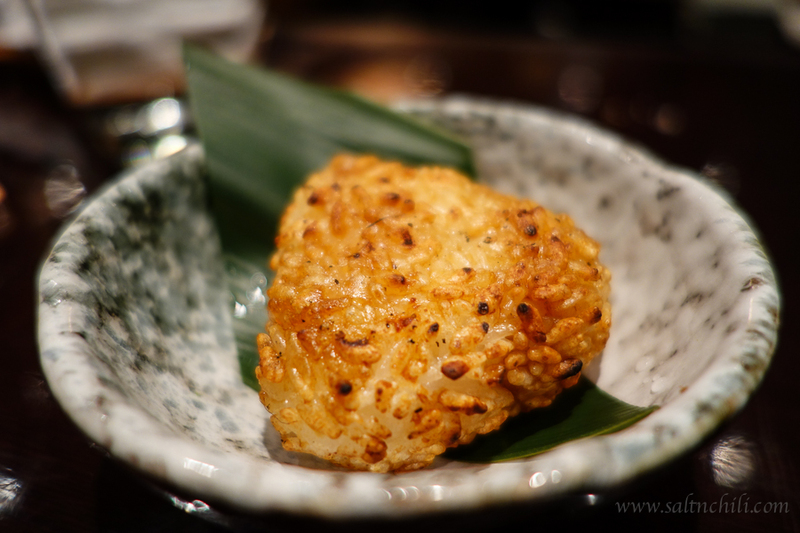 I took a bite, it was crispy on the outside, reminding me of aromatic burnt rice (飯焦) and chewy on the inside. Near the end of our dinner (mid-way for the other patrons) there was a traditional mochi-pounding ceremony, known as Mochitsuki. 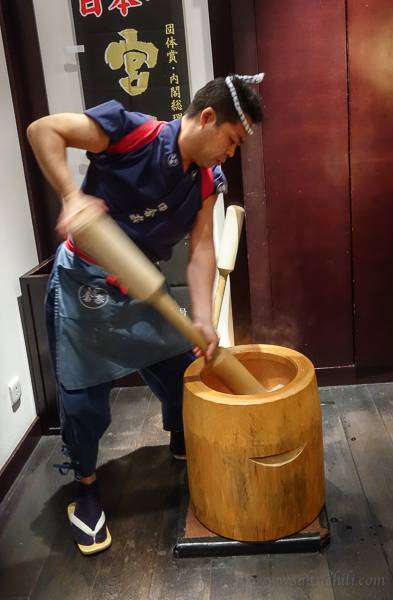 The chef’s would invite the guests to help pound the mochi, a Japanese sweet rice cake, with a wooden mortar. After the ceremony we were ready to leave, but they asked us to stay longer because they were going to serve the mochi that was just pounded, and we were delighted to wait. As we were waiting, the chefs performed a clapping ceremony, where they got everyone to clap in unison. They told us it was for luck. I wish I was quick enough to capture a video to share with you all. 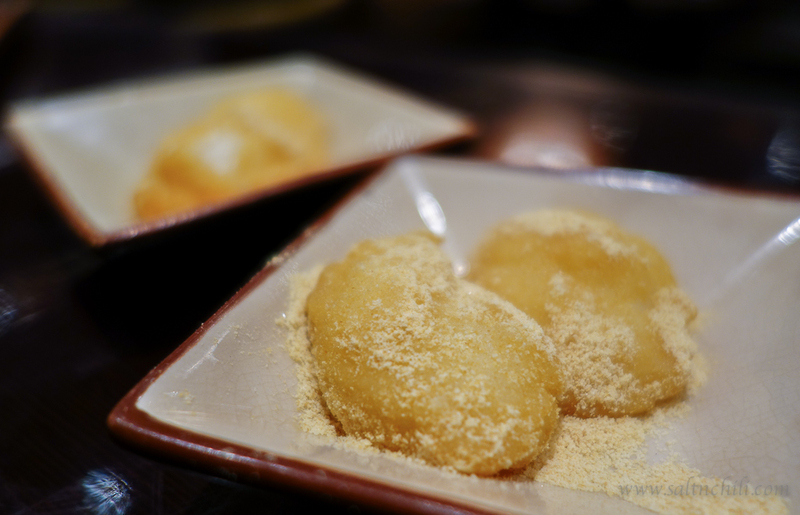 And finally…the mochi. 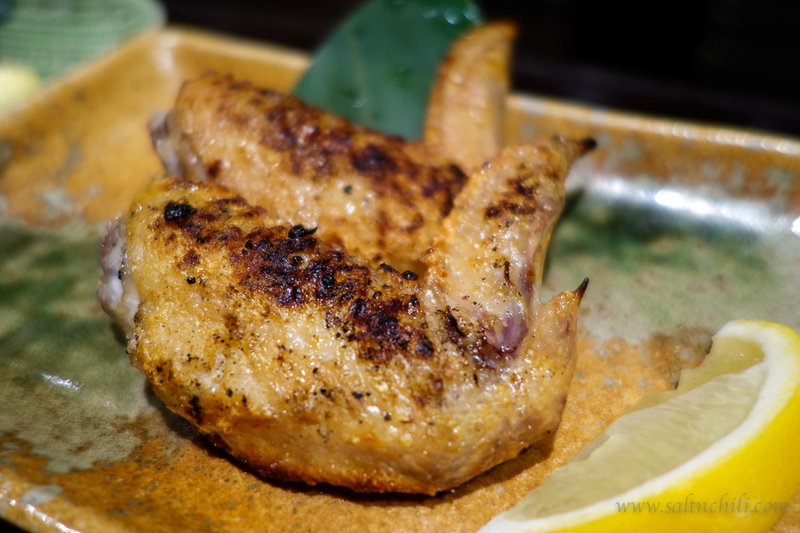 It was served with kinako, a sweet roasted soy bean powder. It was the perfect ending to a theatrical dining experience. Lovely! Looks like a wonderful experience. Thanks for sharing!